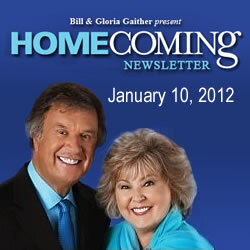 Welcome to our first Homecoming Magazine newsletter! Happy New Year! We are blessed to have such wonderful readers, and we hope 2012 will be a great year for all of you. The past year has been an eventful one for Homecoming Magazine, and we are excited to see what the next year will bring. We hope you’ll find these newsletters to be entertaining and informative reading, as we keep you posted on the latest Homecoming news, happenings, special offers and contests! You can also find us on Facebook and on Twitter (as @Homecoming_Mag), so be sure to come visit and say hello! In the past year, our world has been touched by many events. From tragedies like tornadoes and tsunamis to the splendor of the royal wedding, we have seen many highs and lows. Let's take a look at some of the noteworthy events from the past 12 months in the lives of Homecoming Friends. We are so excited to introduce SQuire Rushnell (yep, that’s a capital Q) as Homecoming’s latest columnist! The author of the When God Winks: How the Power of Coincidence Guides Your Life, SQuire will be sharing encouraging stories of some of the wonderful and unexpected ways God communicates his love to us. To watch SQuire sharing a Godwink story about comedian Tim Conway, click here. You can read more about SQuire in the current issue of Homecoming Magazine. If you're not already a subscriber, there's only a short time left to get the Jan./Feb. 2012 issue as your first one! Subscribe by clicking here, or by calling 1-800-527-5226. Tickets are currently on sale for Family Fest in the Smokies, scheduled for May 25th, 2012! Escape to the breathtaking Smoky Mountains of Gatlinburg, Tennessee, for this wonderful three-day musical celebration. This Memorial Day weekend event features evening concerts and morning worship services, Friday evening through Sunday, and features an incredible lineup of gospel music’s finest artists and speakers. To purchase tickets, click here! Did you know that you can now buy individual issues of Homecoming Magazine from our website? We have nearly all published issues available, including the popular premier issue from Jan./Feb. 2003. If you have missed an issue featuring your favorite Homecoming artist or would like to introduce a friend to the magazine, check out our selection now! Click here for online store!